What the census can tell you: Our resident expert shares her tips! In this Start Your Family Tree Week special guest post, family historian Amy Sell gives an insight into why UK census records are so valuable in finding your British ancestors and growing your family tree. Census records are fantastic for family history research. They'll give you some incredibly useful information about your ancestors' lives and can often reveal new names to add to your family tree. You'll find census records from England, Wales and Scotland at Findmypast. The collection covers 1841-1911, with records taken every 10 years. Forms gradually got more detailed as time went on, so you'll usually find more information about your family members in later census records. 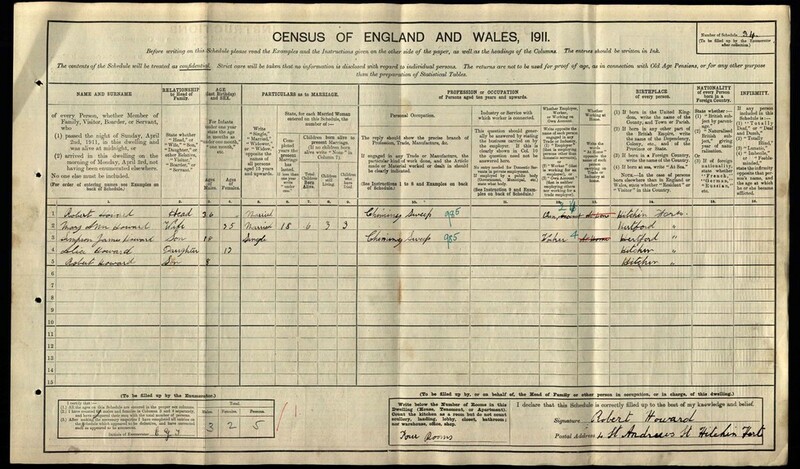 The earliest English and Welsh census records available online are from 1841. At the time of the 1841 census, our ancestors were asked where they were living, their names, ages, occupations and where they'd been born. This birth information was limited to two yes or no answers, addressing whether your ancestor was living in their birth county and, if not, whether they'd been born in Scotland, Ireland or further afield. If you were over 15 years old when the 1841 census was taken, your age was also rounded down to the nearest multiple of five. So in the example above, while James and Ann Howard were recorded as being 20 years old, they could actually have been anywhere between 20 and 24. Taken 70 years later, the 1911 census recorded much more detail. We're shown our ancestors' names, exact ages and places of birth, nationality if they weren't born in England and Wales, occupations, address and how many rooms they were living in. You'll also find the signature of the person who completed the form in the bottom right-hand corner. The 1911 census was known as the 'fertility census' because the form asked for information about the length of a woman's marriage, how many children she'd had and how many were still alive. In the example below, you'll notice that of six children, sadly only three had survived. Don't forget that you can claim a 1 month subscription to Findmypast for just $5 all week - and enjoy searching all of our census records for your ancestors. This will give you access to the census collection and millions of other historical records to help you start building your family tree.